Is it just me, or would anyone else absolutely refuse to pay $20,000 for a bag - even if they had all the money in the world? Labels: Bags, Luxury, Say Whaaat? Thanks alot mate Maid of Melrose, this is a really nice Say Whaaat? 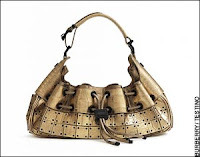 : $20,000 Handbag :) I’m bookmarking this page! !